The Star Wars franchise, in conjunction with Funko, have put together a subscription box featuring exclusive Star Wars themed merchandise and it's not too late for you to get your hands on them for yourself. This also makes a great gift for any Star Wars fan in your life. My guess is that with the new film just recently released, we'll see the popularity of things like this only continue to grow. These boxes from Funko are sent out every other month and packed full of cool stuff with themes focused around different parts of the Star Wars universe. The first theme was "The First Order". Total value for the items in each box is around $50, but the cost of the subscription is $25 plus shipping, handling, and tax. There's no fluff here as each box comes with high quality products including apparel, accessories, toys and other memorabilia. Some examples of what came in the premiere box include a Captain Phasma Chome Pop! bobble-head, another bobble-head figure, t-shirt (people reported various designs), lanyard (people also reported various designs, Tie Fighter patch and a Kylo Ren pen. 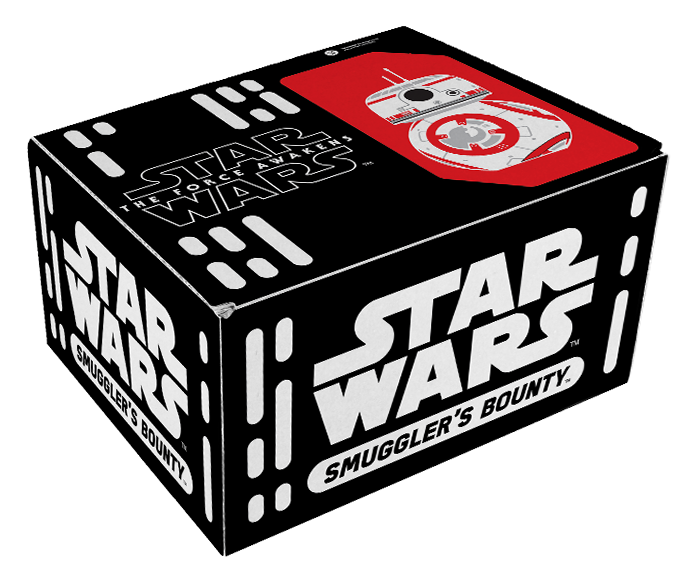 A search on Instagram for #smugglersbounty or #smugglersbountybox will show you what many others have received in their boxes. There's really some good stuff in there, sure to please any Star Wars fan or collector.